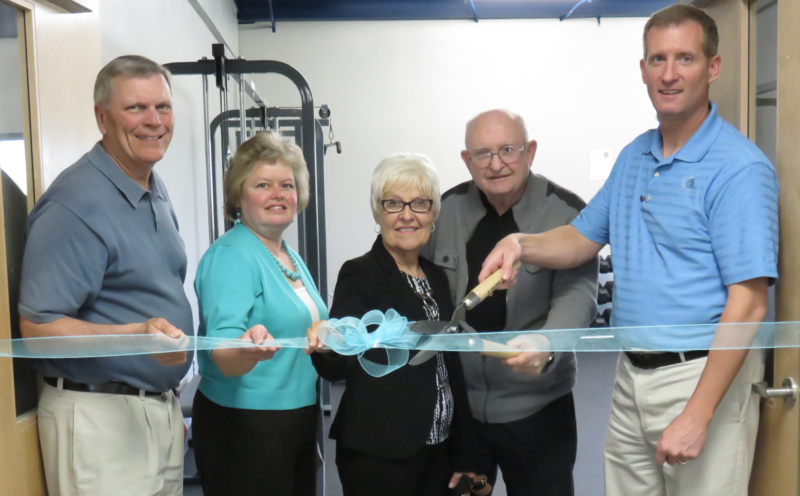 (New Providence, IA) – On April 23rd, The Promise Academy at Quakerdale dedicated its fitness room in Broer Center on their New Providence Campus. This fitness room was made possible through the generosity of donations given by Royal Young Family in memory of Paula Young and a grant received from the Hardin County Community Endowment Foundation. Many volunteers gave of their time and talents to work alongside staff to complete the project. Student from the Industrial Arts program at South Hardin High School are just one example. The fitness room, along with the Whitehead Gymnasium, is designed to enhance wellness resource accessibility for youth and adults living in rural Hardin County. The Broer Center allows students, staff, and community members to improve their health and well-being by creating a multi-purpose fitness complex that currently includes a gym and fitness room with plans to complete locker rooms and a training room. The Promise Academy Eagle’s basketball team calls the facility home, and is used by the student population, the Hardin County Home Educators, the Greater Eldora Youth Sports Program, and twenty plus people from surrounding communities play basketball in the gym every Sunday night. For information and use and memberships, contact The Promise Academy by phone at (641) 497-5294 or by email using PromiseAcademy@Quakerdale.org.